My English rose “Abraham Darby” sits in a pot and looks ugly for most of the year. It’s an awkward bush, with long stems jutting out at weird angles, covered by huge thorns. You have to navigate carefully around its pot or spend minutes untangling your clothes from the branches. And not only is this bush particularly ugly and lacking in grace, the foliage is prone to blackpot and burns in the sun. That said, “Abraham Darby” is probably the most oft-photographed and oft-smelled single plant in my garden. Why? This may be an ugly bush that is constantly unhappy with our Texas climate, which bursts fully into bloom maybe twice a year if I’m lucky, but when “Abraham Darby” flowers, I am mesmerized. 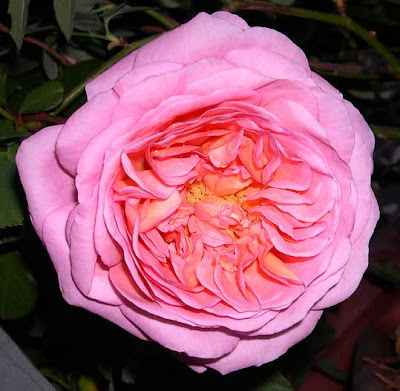 28 Responses to English rose "Abraham Darby"
Wow, that is one beautiful rose, and it clearly understands that it must be spectacular at times to make up for its looks the rest of the year. Just found you on Blotanical. I grow Abraham Darby as well. The bush is just awful, but the blooms are wonderful. Vertie – I agree. Mr. Darby is wily that way.Annie – Yes, the flowers are huge! The color of the blooms changes for me, too, and the bicolor seems to be the most pronounced at low temperatures. And the first blooms in every flush are more intensely colored than the rest. I’ll post a few more pictures in my next update. 🙂Dee – If only someone could breed the blooms to a bushier, healthier bush. I wonder what I need to sacrifice to the flower gods to make that happen. Clearly, lots of weeds aren’t cutting it. 😉Aunt Debbi – Thanks for commenting! Have you figured out a good way to hide the gawkiness of the bush? I’m thinking of cutting mine back and then trying to train it around a rose pillar so that at least it’s not sticking out its long thorny arms to catch on everything.Amy – The thought of the blooms and fragrance are what keeps me from yanking the bush up and dumping it in the trash when it looks so incredibly miserable every summer. Poor rose. Lee – Weirdly, I’ve found that English roses are bad vase roses. I’ve tried cutting both Graham Thomas and Abraham Darby for the vase, and no matter how careful I was with recutting the stems underwater, etc., all the petals would fall off within hours. On the other hand, I’ve found that Duchesse de Brabant is a fabulous vase rose– the last time I cut a bouquet with some verbena, it lasted a week! Holy cow, those are some enormous (and gorgeous) blooms! That’s really all my rose-ignorant self has to add. 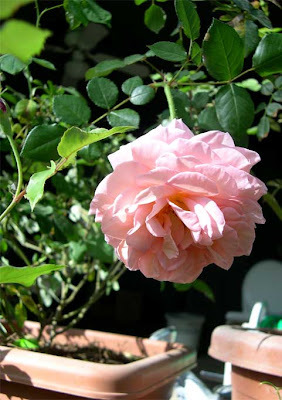 Surferboy – My Abraham Darby is a grafted rose since that was all I could find in town, and I suspect that it would perform better on its own roots. The Antique Rose Emporium is now selling it on its own roots, but they sold out before I could buy one. I’m going to have to look into that Yves Piaget rose you mentioned. I’m a sucker for an amazing fragrance. Couldn’t resist making a comment. I am awaiting the arrival of my first ever rose bush to plant. It is an Abraham Darby and I plan to put it in front of a window that has been reported a window peeper was peering through. I want a wonderful fragrance, great thorns, and beautiful roses. If the branches get ugly, well, Clematis climbing and blooming throughout the rose bush would be splendid, especially if it has a fragrance. Bought this last year for its amazing perfume. At present 3′ high and not a bud in sight. Having read some comments here I will try out the old saying ‘growth follows the knife’ and will give it a ruthless prune, at the same time trying to get the cuttings to root. 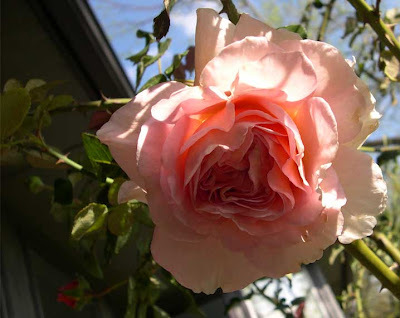 Still growing in KS – I can definitely promise you that you’ll get huge thorns and huge fragrance from Abraham Darby. Maybe it’ll grow differently in KS, but I’d actually recommend getting 3 plants to put in front of your window to make a denser bush, and because you’ll get more flowers if you prune it back hard a couple times a year. 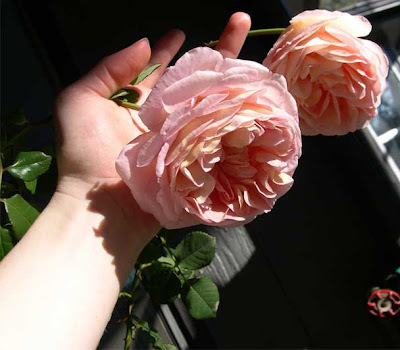 I hope Abraham Darby does well for you, and as a bonus, what a perfect fragrant rose to have under an open window! 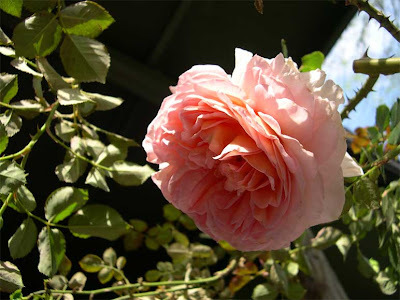 Anonymous – I’ve noticed that Abraham Darby is definitely one of those roses that responds to being cut back yard. I recommend a hard pruning, followed by SuperThrive and some seaweed or fish emulsion. I didn’t have any flowers all spring, and after I gave up and lopped everything back by 2/3 and fertilized, the bush is covered in buds. Hopefully the same thing will work for you. Nice information posted here.. Really very interesting. 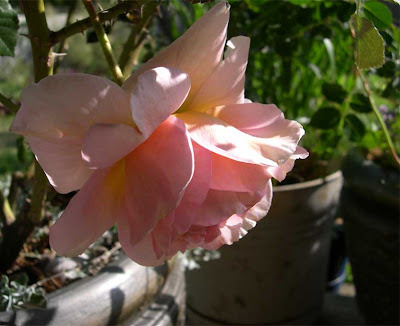 Thanks for posting this blog.. Like the rose..
Hi! I am reading your comments, you describe this rose so well! My bush is getting so much bigger and this year I have tons of blooms. I planted it about 2007 as a small shrub, with a few stocks less that three feet tall, now it has several 10-12 foot stocks and I am wishing I had an arch to support it! I tied it up to a fence, which helps. The stalks are somewhat hidden by plantings in front, and it is near a lilac. I am trying to hid the unsightly parts by allowing a clematis to climb up the stalks. They do this at the Brooklyn Botanic Garden on roses along an arched pathway. So far my the clematis is not taking off, I think it is too shady at that spot. Rats. If done right, when the rose blooms stop, the clematis starts. Mutually beneficial. I get one bloom a season up north here. I think last year would have been better, but some squirrel chopped off all of the top buds close to the fence! Nasty little creatures. Thank you for posting your photographs, they are lovely. I have nurtured this perfumed , peach & apricot colored rose , over 12 Minnesota winters using the 'tipping' method . Today she sits on a pedestal in my tiny , nearly sunless garden ready to bloom , again . Amazing rose worth every effort. Flowers are so adorable and enhances the beauty of a certain place that has it, not just a garden that is beautified, but any place. Abraham Darby is my favorite rose. I deal with black spot, but the healthier the rose the less spot I have to deal with. I live in the PNW and grow my roses on their own root stock (heirloom roses). My husband took cuttings in early Fall and they all took. Planting them in groups in the middle of the boarder with plants that have lovely leaves in front works for me. I tend to prune them hard as part of collecting flowers but otherwise I let them run into each other and they look fine in the boarder. I use the flowers in arrangements in two ways. In small vases and silver bowls. I have photos of them but need to figure out how to share them in this format. This is my first post of this kind ever. It took AD to get me to want to share. It is lovely to find other gardeners that are as crazy about its color and scent as I am. Thanks for the good info and the suggestions for new roses. Hello, Such a wonderful blog i ever read. I just want to leave a little comment to support you. Your post is great. Thank you for sharing great information to us.